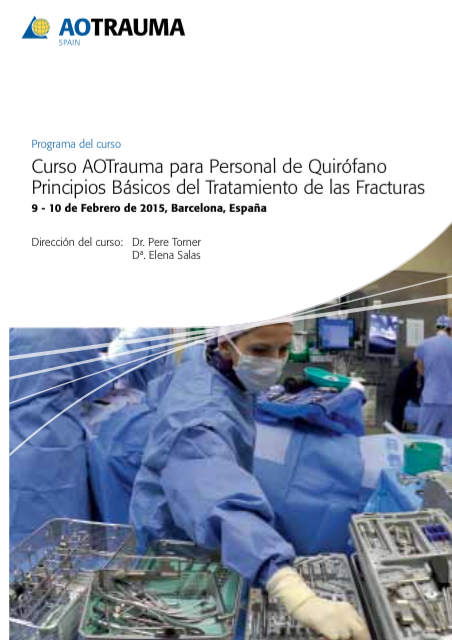 AO Trauma Course—Basic Principles of Fracture Management for Operating Room Personnel (ORP) has been from 9th to 10th February 2015 in Barcelona (Spain). During the Barcelona course, all lectures (by nurses and surgeons) were clear, orientated to nursing and the faculties were confident, good communicators. Some lecturers have used the lecture presentations translated to Spanish by Elena Miguel from the website of AO Trauma. Elena Miguel has been faculty and instructor in this course. In the practical exercises, participants watched the video and afterwards they did the respective practical exercise. There were five tables with 6 posts and a nurse and a surgeon as table instructors in each table. All these allowed to all participants to do the exercise and to ask doubts to instructors and they said that they have learnt a lot doing these exercises. During this activity the participants were active and enthusiastic. This kind of course is very interesting for operating room personnel because participants are trained in the application of fixation techniques and familiarization with the instrumentation. And discussions in small groups help participants to understand the decision-making process in fracture management and the importance of appropriate nursing preparations.